I was scrolling through Pinterest, when I saw the quote I chose for this week. It made me smile. Life gets hard sometimes, but this quote encourages us to put a positive spin on whatever situation we are in. So when you end up on the ground, take advantage of the point of view that you have to check out the stars and the beautiful night sky. Find the silver lining as much as you can in a situation. This printable was supposed to go out last week, but I ended up going out-of-town. So I did my sketching of the printable on my iPad in Procreate and then Adobe Draw. From Adobe Draw, I was able to send the file to Illustrator on my computer. Look At The Stars Quote Printable from Raye Allison Creations. 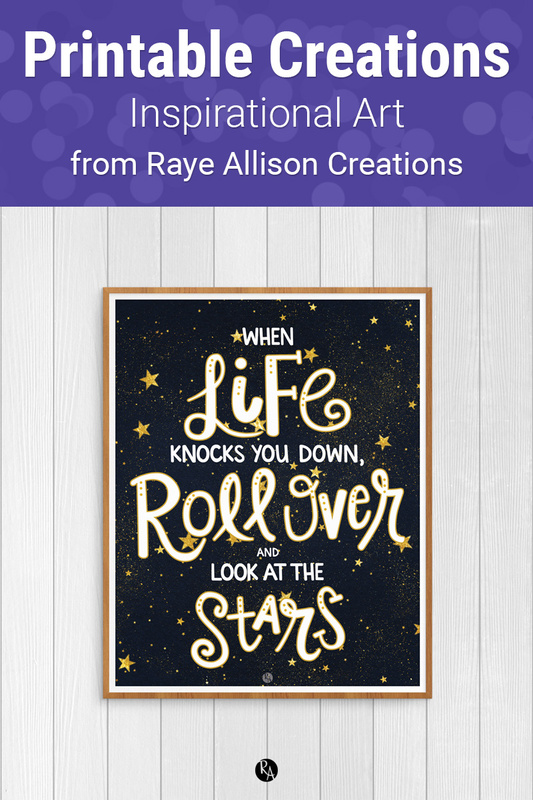 This week's printable quote is, "When life knocks you down, roll over and look at the stars." Printables are great for home or office decor, classrooms, church bulletin boards, and so much more!